The carrier does so at a profitable rate, but then needs a haul to get back home so they partner with a broker to take a shipment at a discount and cover their expenses returning home. That made sense, at one-time when the world was larger and less connected. Not too long ago it was a perfect model – pre-internet, pre-load board in every home, pre-smartphone when there were only a few national brokerage firms who posted loads on closed-circuit TV’s in truckstops. Today the world is smaller and more connected – there are almost 20,000 brokerage firms that post on load boards on every home and office computer screen and smartphone nationwide and drivers go down the road receiving alerts about shipments that match their desired criteria without even having to look for them. So, it is true that adding 10 or 20 or 100 brokers to your vendor list makes no sense if they are going to do the same thing in the same way as each other. As a matter of fact that is exactly the popular definition of business insanity – to do the same thing the same way over and over again expecting different results. 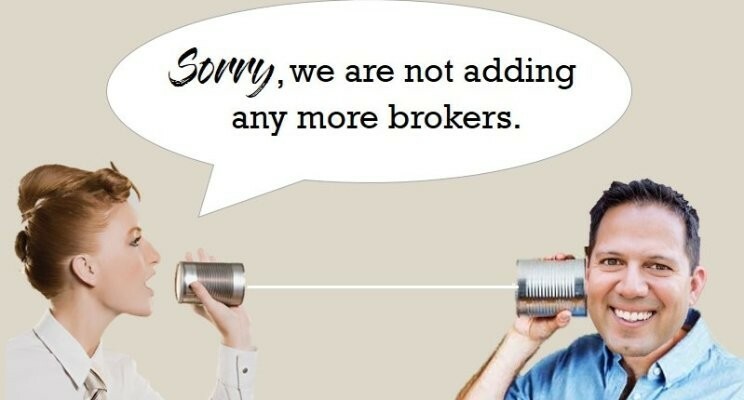 I think that what transportation buyers really mean to say is that they are not adding any additional backhaul brokers. We move the front-haul. This isn’t a back-haul model in which we exploit a truck desperate to get home somehow. This is a front-haul model in which we provide capacity by convincing somebody to do something they otherwise were not going to do and to do it well and fully committed because it is worth their while. We have to be the first people to work in the morning, the last people to go home at night, on-call 24/7, have immediate response times and never leave our desks, track every single shipment, be 100% transparent with carriers and customers at all times, accept 100% of the shipments we are called on to assist with, own robust software that interfaces with every industry tool, and truly pay our carriers well and quickly. We provide value in a partnership with customers who have the right characteristics and culture to find a relationship with us to be advantageous by supporting their routing guide 24/7 and their customers at the moment we are called upon to do so. We receive value from partnerships with carriers who are reliable and transparent and choose to do business with us over our competitors while complying with our procedures which set-up everybody to be successful. Ultimately, we are in the middle and we provide excess capacity where it is needed, when it is needed. The front-haul works for me and for Surge Transportation. I do understand that it is not for everybody; it is not easy at all and be prepared to work really hard only to lose lots of money on some days, but it works for me and my target customers. When I attend industry trade shows, I believe the question I hear most often from colleagues is “How do I stand out?” I don’t know what is going to work for my colleagues, but I do know that if you are just another one of 20,000 back-haul styled operations, then it’s going to be, “Sorry, we are not adding any more brokers.” Determine what you are really good at, focus on developing that to the greatest extent possible, find customers who need exactly your specific skill or service, start that marriage, and treat every single shipment like your entire career depends on it – you’ll do well, good luck.